My local Starbucks barista put down her Race Together pen. 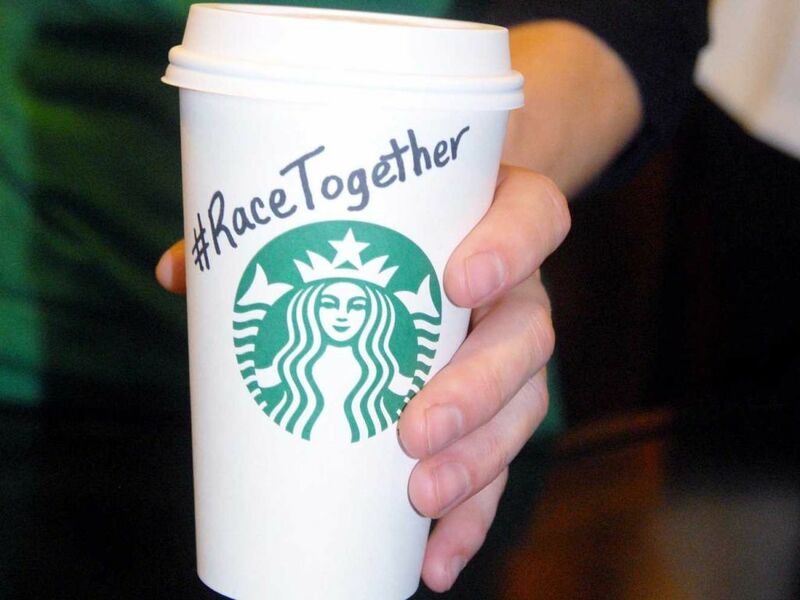 Starbucks brewed Race Together - it's racial-awareness program which ended in stores this week - as a response to pervasive racial inequality in the United States and the specific events of police brutality against African Americans. Starbucks' CEO Howard Schultz explained the genesis of Race Together in direct, earnest, call-to-action remarks on a web page dedicated to the program, notable for its sharp candor and lack of corporate blandness: "As I look at the current situation in Ferguson, New York, Cleveland, and for that matter the rest of the country, with regard to racial tension, racial inequality, the unfortunate situations between police and people of color, I think there's an outcry of action that's required of the citizenry of the country, as well as the government." He concludes: "It requires businesses and business leaders and the citizenry of the country to recognize that we have to come together and do all that we can to make a positive difference and not be a bystander." Schultz delivered his civics lesson from the worn wooden seat of an old school auditorium. Volunteering to facilitate a national conversation on race relations is a courageous bet - I couldn't imagine many other CEOs taking this on. However, inevitably, public cynicism of corporations and their hidden agendas sabotaged Schultz's seemingly sincere and noble intentions. Schultz's Race Together address was about the issues plaguing the country, not the company and its 800-pound gorilla: Our customers are white, our baristas are brown and black. Something's wrong with this plantation picture. It's too bad, and a missed opportunity. If Schultz had been willing to turn his critical lens on Starbucks first, as a microcosm of the national situation, he could have blunted the backlash - a reaction that will only serve to scare off other companies from addressing the intractable social issues which effect their employees and customers. Corporate impact on our lives - economic, political, cultural - is enormous, and it's in our interest that companies get it right. But they almost never do. "I understand you are coming to New York. As a long-time resident of NYC, I would like to ask you what your current stance on gay marriage is. I'm sure you'd rather I focus on your new healthy options and scholarships, and I will - and will even eat at your restaurant - as long as you can assure me you are not involved in opposing gay marriage. If so, then, Welcome to New York!" "Thank you for taking the time to contact Chick-fil-A. Chick-fil-A and its restaurant Operators employ more than 75,000 individuals who represent diverse viewpoints and lifestyles. Our only goal is to serve great food and provide the best service for our customers. Again, thank you for your time and interest in Chick-fil-A." In other words: While we may agree or disagree with the political views of our dearly departed founder, we have summoned neither the corporate consensus nor courage to be honest with you, our potential customer. We hope that this chicken talk will provide you with the white meat of ignorance required to violate your personal belief and buy our product. With Starbucks' failed attempt at honest dialogue, I'm not sure what company can succeed given the insulting cowardice of the Chick-fil-A's of the world and the fundamental impulse of corporations to paper over the bold actions necessary for change. This past winter, I was hired by a corporation to create internal communications materials promoting the importance of achieving diversity in the workplace and the value of embracing ethnic, racial and gender differences and experiences. This was uncomfortably understood as management's response to their poor record of hiring and promoting women and ethnic minorities. You didn't have to look far to see the problem. The corporate directors' composite photo in the annual report looked like the portrait gallery of the Augusta National Golf Club. My work was going well enough, trying to articulate the situation with a mixture of clarity and commitment, when I received a call from my client, an African-American woman, on the Monday of the federal Martin Luther King, Jr. holiday. "I'm surprised to hear from you," I said. "I assumed the office would be closed today." "No, we're open," she said. "It's an optional holiday for private businesses." "I know, but it is ironic," I said. "I mean, we're working on a program about embracing cultural diversity in the workplace. Not honoring the holiday undermines the company's ambition to correct the current situation, wouldn't you say?" She hesitated before speaking, somberly. "I can't say." My client is a nice person in a miserable situation, and I didn't relish putting her on the spot. I wasn't telling her anything she hadn't already thought of herself, and I'd hate to be in her place. But unless corporations and the people who work for them have the nerve to be honest about the hard realities of corporate citizenry, and the wounds they'll have to inflict on themselves, they'll fail to change the cynicism of the public, even if the cause is as meaningful as Howard Schultz's was. Corporations are people: imperfect, cautious, self-interested, but also dynamic, useful and capable of change. Race Together was a flawed worthy experiment that was, unfortunately, doomed from the start. Now, the only colors that my Starbucks barista is talking about are the coffee and cream in my un-sloganed cup.